Is Pembina Pipeline Corporation a Buy? 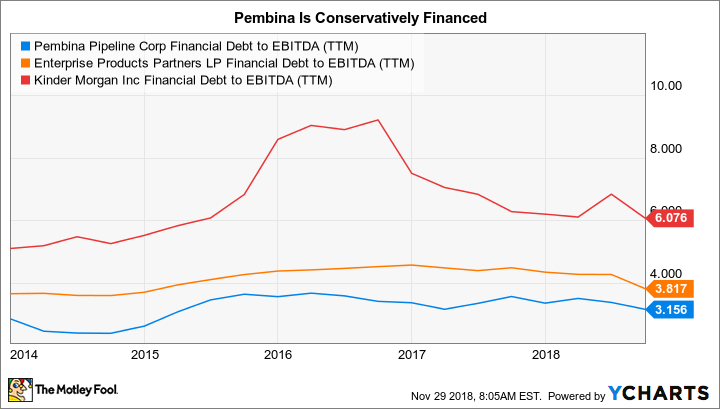 Pembina may not be a name you know, but its 5% yield is worth a close look in the midstream space. Investors looking at the midstream sector will likely recognize industry bellwethers like Enterprise Products Partners and Kinder Morgan, which are giants in the space. Pembina Pipeline Corporation (NYSE:PBA), on the other hand, might not be a familiar name. That's too bad, because this Canadian-based midstream company, with its roughly 5% yield, is worth a very close look. Here's why Pembina should be on your short list of midstream dividend payers today. Pembina is based in Canada and has assets in the United States and its home country. It operates roughly 11,000 miles of pipelines, with a leading position in the Canadian Oil Sands region. Oil sands assets tend to have very long reserve lives, which provide a solid foundation for the company's cash flows. (Teck Resources' recently completed Fort Hills oil sands project, for example, is projected to produce for at least 45 years.) Pembina also operates processing, storage, and terminal facilities. About 85% of adjusted EBITDA comes from fees. The company was once structured as a Canadian royalty trust, but converted to a regular corporation in 2010. That decision followed Canadian tax law changes that removed the main benefits of the royalty trust structure. While other conversions at the time were accompanied by dividend cuts, Pembina was able to maintain its payout despite the change in structure. Indeed, it has grown the distribution since then. This is a notable statement about the company's commitment to returning value to investors via dividends. Note also that Pembina's dividend is paid monthly. That means that investors using the income they generate from their portfolio don't have to wait for a quarterly check and then budget that out over the next three months. Owning Pembina is sort of like replacing your normal monthly paycheck. And the roughly 5% yield is fairly generous, more than doubling what you would get from an S&P 500 Index fund. The one caveat with the dividend, however, is that Pembina pays in Canadian dollars. The actual dollar value U.S. investors receive will vary with exchange rates. That's not so desirable, but exchange-rate ups and downs tend to cancel out over time. Pembina has targeted to pay roughly 85% of its fee-based cash flow out to shareholders in 2018 (its long-term goal is to keep that number below 100%). Since roughly 15% of its cash flow comes from other sources, it has a traditional payout ratio of roughly 60%, a relatively modest number. That, in turn, means there's room for dividend increases and plenty of cash flow to invest in growth projects. On that front, Pembina has roughly CA$18 billion ($13.5 billion) in growth projects it would like to build. Right now it has CA$3.1 billion of projects under construction with in-service dates through 2021. It expects these projects to increase EBITDA by CA$300 million to CA$450 million per year. That, in turn, should support continued dividend growth. The remaining CA$15 billion or so of potential projects provides material opportunity for investment beyond 2021. PBA Financial Debt to EBITDA (TTM) data by YCharts. Notably, Pembina believes it can fund its current growth plans with internal cash and debt. That means it won't need to issue shares, which would dilute current shareholders. Debt levels, meanwhile, are modest, providing ample room on the balance sheet to support the company's spending plans. In other words, Pembina is well positioned to grow its business and keep rewarding investors as it does. Although Pembina's 5% yield is lower than some of its midstream peers, the company has a solid, conservatively financed, fee-based business; a proven track record of rewarding investors via dividend hikes (including through a major corporate overhaul), and a pipeline of projects to support long-term growth. The monthly dividend adds to the appeal for investors looking to live off the income their portfolios generate. If you are researching the midstream space, Pembina should be on your short list today. In fact, once you do a deep dive, you're likely to find that it would fit very well in a diversified income portfolio.